Get expert advice on whiplash claims with a free, no obligation consultation. While whiplash claims tend to attract negative headlines because of fraudulent car crash whiplash claims or “crash for cash scams”, it is easy to forget there are many valid claims for whiplash compensation. Whiplash is most commonly associated with road traffic accidents but it can also be caused as a result of a blow to the head while playing contact sports, being struck on the head by a heavy, solid object or a fall where the head is jolted forwards or backwards with a sudden, severe force. If your whiplash injury was caused due to someone else’s fault, you may have sufficient grounds for filing a whiplash claim. The term “whiplash” first arose back in 1928 and is predominantly used to describe an injury to the neck or surrounding area. The sudden movement can cause not only ligament and tendon damage in the neck which can be extremely painful and sometimes difficult to treat, but in severe cases may cause traumatic brain injury. A violent twist of the body/neck which can occur in the gym or a bungee jump. Being struck on the head by a heavy solid object. A sudden, and often unexpected, blow to the head area which can occur in sports such as boxing, football and rugby. A seemingly innocuous slip or fall, often on a slippery surface, which cause a sudden and violent jolt of the head. One of the problems with a whiplash injury is the fact that it can take several hours to develop and the pain to kick in. In many cases neck pain and stiffness in the surrounding area can occur the next day and may get gradually worse for several days. In the vast majority of whiplash claims it is tendon and soft tissue damage around the neck which causes pain and suffering but this can also emerge in the shape of spine and severe neck muscle spasms. There is a common misconception that whiplash is not generally a serious injury, however, in some circumstances, especially where there is spinal damage or even brain damage, it will have serious repercussions for the victim. As with more common whiplash symptoms, many of the additional injuries may not emerge until up to 12 hours after the incident. In the vast majority of cases the pain will subside relatively quickly but where there has been an extreme jolt and excessive injury this can have a longer-term impact and in some cases be permanent. Even if young children, babies and toddlers are correctly strapped into their car seats they can still receive whiplash injuries which they may have difficulty expressing to you. In some cases there may be no visible signs of injury but you must monitor those who have been in an impact injury for reduced neck movement, dizziness, nausea, changing sleeping patterns and mood swings. It would be preferable to have them checked out by a doctor if there is even the slightest chance of whiplash injury but even then you will still have to monitor their demeanour for many days after the incident. 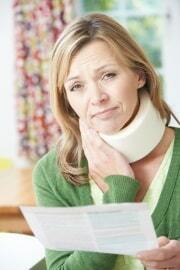 If you receive a whiplash injury it is imperative that you seek medical attention straight away. It may be that short-term treatment with painkillers will resolve the issue but if you are looking to lodge a whiplash claim for compensation then a doctor’s diagnosis would be extremely useful. In the vast majority of cases there is no need for x-rays and scans, unless there is significant pain, because soft tissue injuries would not show up. However, the UK government is set to make it a statutory requirement that whiplash compensation payments can only be made where a medical diagnosis confirming the condition has been presented to the courts. This is a hereditary problem going back many years when insurance companies found it cheaper to pay out on relatively minor whiplash claims, whether valid or fraudulent, as the potential defence costs far outweighed minor compensation claims for whiplash. As you can guess, it did not take the fraudsters very long to realise that a well presented case with limited evidence might well yield them compensation with no need to go before the courts. However, the historic number of fraudulent whiplash cases created a stigma which inadvertently impacted those with valid whiplash compensation claims. The first thing to do if you are involved in an impact accident causing whiplash, such as a coming together of vehicles where there is a sudden jolt to the head, is to seek medical assistance straight away. While there may be limited treatment available in the short term, with whiplash injuries often taking between six and 12 hours to emerge, you will be given advice about symptoms to look out for. It is often a good idea to arrange a follow-up examination with your regular doctor thereby ensuring that no injuries are missed. Aside from the fact that this initial action will ensure you receive the correct treatment and advice it will also be noted on your medical records and may be used as evidence in a court of law should you pursue a whiplash claim. When you’re able to you should also collate any other additional evidence such as witness statements, photographs and police reports where the authorities were called. Even though you have a three-year window of opportunity in which to lodge a claim for whiplash injuries, it is sensible to lodge your claim sooner rather than later. A timeline of events surrounding the whiplash injury will also add more strength to your claim but, if this is left for a matter of months or years, details can become blurred which can in some circumstances weaken a perfectly valid whiplash compensation claim. When all of the information and evidence has been collated you should contact a personal injury solicitor so they can review the details of your accident and give an expert opinion on whether they think your claim would be successful and what whiplash compensation settlement you might receive. Whether you received your whiplash injuries from a motor vehicle accident, blow to the head or a simple slip on an icy path, you will need to prove negligence on behalf of a third party which resulted in your injuries. Experienced personal injury solicitors will know exactly how to build a strong whiplash compensation claim. They will also have access to third-party independent doctors if a further examination is required to strengthen your case. Should they conclude you have a good claim to whiplash compensation the vast majority of solicitors/law firms will offer you a No Win No Fee arrangement which basically means you are not liable for their legal expenses whether or not your claim is successful. They will however need to agree a success fee with you which will be up to 25% of any compensation awarded. In the majority of whiplash claims, where negligence is quite obvious, the defendant will almost certainly look to settle out of court to save on any legal fees and bring the matter to a swift close. There might be instances where negligence is contested, or there may be more than one negligent party, which will likely result in a court case. It is worth saying at this point that it is not the claimant’s responsibility to prove a specific level of negligence/liability for the whiplash injury where more than one party may be involved – this is something the courts will rule on after reviewing all evidence. The average settlement amount for whiplash is currently around £1850. This is likely to change with incoming regulatory amendments specifying a £425 maximum limit on basic whiplash compensation claims. However the severity of the whiplash injury and the time it takes for you to recover will help in calculating the amount of whiplash compensation you actually receive. For neck injuries that are classed as minor, anywhere from a few hundred pounds up to £6,000. For neck injuries that are classed as moderate, £6,000 to £29,250. For neck injuries that are classed as severe, £34,575 to £112,750. Any compensation award may also include injuries to the shoulders, head, back, and nerve damage which can impact extremities such as the fingers and toes. When pursuing a whiplash compensation claim you should get legal advice from a solicitor specialising in whiplash claims who can go over every detail with you and then come to a compensation figure that they believe you would be entitled to claim for. There is no degree of variation/discretion when it comes to special damages as these relate specifically to financial redress and future funding requirements. There are some anomalies when it comes to whiplash claims one of which is referred to as the “knock-for-knock” settlement. These occur when both sides of an accident admit to a certain degree of negligence/liability when attempting to clarify the cause of the incident. On these occasions, the insurance companies tend to pursue a quick settlement where very often they will pay compensation to their own customers as opposed to the other party. However an experienced solicitor in whiplash claims may get more.